Fish is low in fat and high in protein. It is an excellent source of omega3 fatty acids. Eating fish at least twice a week can reduce the risk of many diseases and disorders. Fish is brain food. Multiple studies have found that people who ate fish regularly have better memories and mental acuity. The omega 3 fatty acids along with vitamin D found particularly in oily fish has been proven to ward off depression and increase cognitive function. 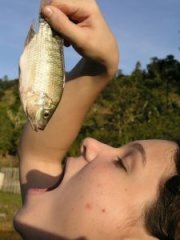 Best of all, fish tastes good. It's easy and quick to prepare and there are countless ways to prepare it and varieties to choose from. Be sure to check out my cook-friendly recipes.